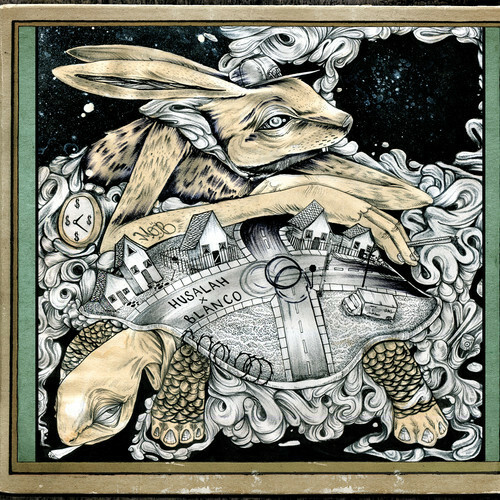 Readying for the release of their forthcoming collaborative EP, Tortoise and the Hare, Bay Area artists Blanco and Husalah, and LA crooner Kokane combine talents to release their second single, “The Butcher And His Customers.” The single, premiered by The Smoking Section, features production by DJ Burn One and a verse from The Jacka. The EP, named following a brainstorm/smoke-sesh, is due for a June 17th release via Guerrilla Entertainment. After working with singer Kokane on RAW, which also features Nipsey Hussle, Blanco immediately recognized their chemistry. “His professionalism was well received,” Blanco states. “He added an original West Coast flavor that I grew up on.” Although being out of the game for a while, Kokane demonstrates absolute control with his soulful vibrato on the harmony-rich hook. He and the other artists manage to showcase their talents without any overcrowding on the track. Blanco (formerly Benny Blanco) is a rapper born in Berkeley, California but bred throughout the Bay Area. Fascinated by gangsta rap at an early age, Blanco began rhyming at 17. In 2004, he and his brother founded hip-hop label Guerilla Entertainment, which to date has released upwards of over 20 mixtapes and albums. As a member of rap trio The Yay Boyz with fellow label mates Taj-He-Spitz and Lil Hyfe, Blanco released Got Purp (Volumes 1 and 2), The Wizeguys, and full-length album Nosebleed Muzic. He has gone on to release several solo projects, including Blanco’s Way and American Pyscho, and more collaborative albums, including Jonestown with Messy Marv and Jacka, and Raw with Nipsey Hussle. Blanco has also collaborated with Gucci Mane, Redman, Freeway, Freddie Gibbs and Styles P, and released projects with Araab Muzik and Yukmouth.